Oleg Deripaska (image centre) has told President Vladimir Putin that the only way to stop the rot at Rusal is to put an internationally respected foreigner at the head of the Rusal board of directors when the company’s annual general meeting (AGM) is held on June 15. Mikhail Prokhorov and Victor Vekselberg have told Putin the only way to stop the rot is to put a trusted Russian at the head of the board, and remove Deripaska from operational control of the company before he destroys it financially. The foreigner Deripaska has told Putin he wants to appoint as chairman of the Rusal board is Matthias Warnig (image left), whose East German government career is not exactly respected outside Moscow. Because Warnig is also thought to be an early career ally of Putin’s, the Deripaska nomination has been interpreted as Putin’s decision. It isn’t, not yet. Putin has told Deripaska he wants a Russian in the chair. Deripaska is afraid that a Russian whom Putin trusts may not trust Deripaska to run the company. 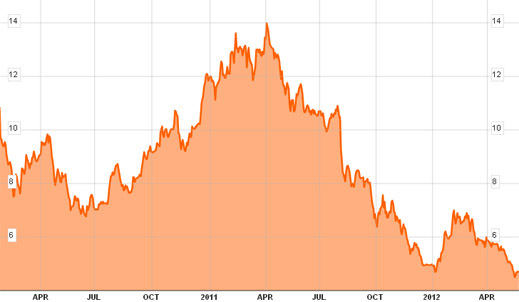 The rot they are all talking about is the collapse of Rusal’s share price to its lowest level ever. At Monday morning’s price of HK$4.63, Rusal is down 62% below its initial public offering (IPO) price of HK$10.80. The downward trajectory is caused by the fall in global demand for aluminium, in China especially; the rise in its Russian costs of production; and the fall in the global price of the metal. Rusal’s market capitalization is now $9.3 billion; that’s less than its net debt of $11.1 billion. Without counting dividends payable from its 25% stake in Norilsk Nickel, the cost of servicing that debt (on first-quarter 2012 figures) would turn Rusal’s bottom-line into loss-making. But Alcoa, the US aluminium leader, is down only 17% over the same period. The Aluminium Company of China (Chalco) is down 52%. The difference, the steepness of the downward curve, reflect the market assessment that Deripaska is toxic for Rusal’s future. In a series of recent talks which the principal Russian shareholders of Rusal have had with Putin, including the state bank Vnesheconombank (VEB), the president has been warned that Deripaska is uncontrollable and ruining the company. Deripaska has countered with the warning that if he is ousted, Rusal’s smelter production may be cut back sharply, and Russian workers thrown out of work in the Urals, Krasnoyarsk, and Irkutsk regions. For nine months of the election campaigns, first for the State Duma and then for the Kremlin, Putin and Igor Sechin, the former deputy prime minister in charge of the metals sector, have been unwilling to concentrate on the competing plans to save Rusal. Other high-ranking officials, who are obliged to Deripaska and to whom he is obliged, have been reluctant to intervene on one side or the other until they were sure of their own futures, and understood which way Putin would decide. During the protracted delay, Deripaska has reinforced the impression that he has convinced Putin he can still command a majority of the shareholder votes, and overrule an alliance of the minorities. Because the placement of Warnig in the Rusal chair requires evicting Barry Cheung (image right), who has been there since Victor Vekselberg resigned from the chair in March, there are national sensitivities to be considered, not to mention the obvious commercial one – Germany doesn’t buy much Rusal aluminium, China does. Cheung has been assured he isn’t being replaced. But this assurance extends only to his seat on the board, not the chairmanship. In March, Putin told Deripaska and the chief executive of VEB, Vladimir Dmitriev, that he was opposed to Cheung as chairman. Dmitriev was told to arrange for the VEB man on the Rusal board, Anatoly Tikhonov, to nominate himself as chairman and to make clear this was what the Kremlin wanted. Tikhonov, it turned out – a former deputy governor in Krasnoyarsk, where Deripaska’s smelter is a major source of revenue, tax, and employment — is under more obligation to Deripaska than Dmitriev realized. Tikhonov construed his independence as a Rusal board director to mean that he would take Deripaska’s orders over Dmitriev’s, even Putin’s. When Deripaska called for the votes to seat Cheung, Tikhonov abstained – on the understanding with Deripaska that this wouldn’t get in the way of Cheung’s election. It remains to be seen whether Putin and Dmitriev are concerned enough about this insubordination to see that Tikhonov is not reelected in the voting on June 15. With less than three weeks to go before then, Rusal hasn’t posted a list of all the nominations to the board. Mikhail Prokhorov’s Onexim holding (which owns 17.02% of the Rusal shares) says it hasn’t seen the nominations either. So it happens that Deripaska is offering Warnig as a compromise between what Putin has said he wants and what Deripaska wants. For the first time in the recent history of Russian national champions, the oligarch shareholder is fearful of a Russian on his board. 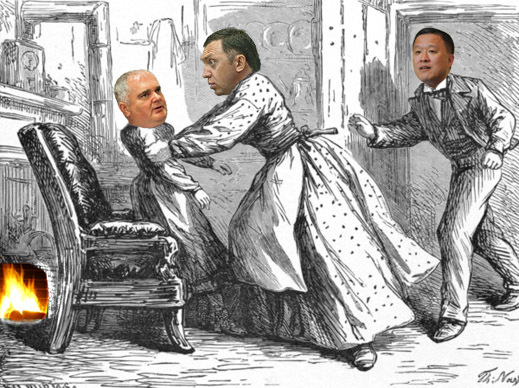 Warnig is being seated, not to satisfy the Hong Kong Stock Exchange rules on independent directors – none of the Rusal independents satisfies that rule – but to keep Putin comfortable with the stasi quo.